What A Shame...Only IISc Ranks In Top 500 Universities In The World! It is a real shame that India does not have a single university in Top 300 according to Academic Ranking of World Universities. And the IITs that we tout so much about, not a single one makes its appearance in Top 500! Indian Institute of Science is the only Indian university to make the appearance on ARWU rankings, that too ranked around three-hundreds-and-something. The worst part is, on a global level, Indian higher education levels are actually falling rather than coming up. According to ARWU, In 2005, India had 3 universities ranked in top 500, the number fell to 2 in 2006 and in 2011 it came down to one. If the fall in our education levels continue, we many not see any Indian universities in top 500 in next couple of years. ARWU’s methodology of ranking includes 4 main parameters – Quality of Education, Quality of Faculty, Research Output and per capita academic performance of an institution. If you look at Top 10, Harvard University has maintained its position of being the Top University in the world and they have been on the top since the inception of these rankings. Stanford, UC Berkeley, MIT and Cambridge University complete the Top 5 universities in the world. Cambridge and Oxford are the only two universities which are not from US in the Top 10 rankings. Infact, 17 of the top 20 universities in the world are all from US. Here are the rankings of Top 20. 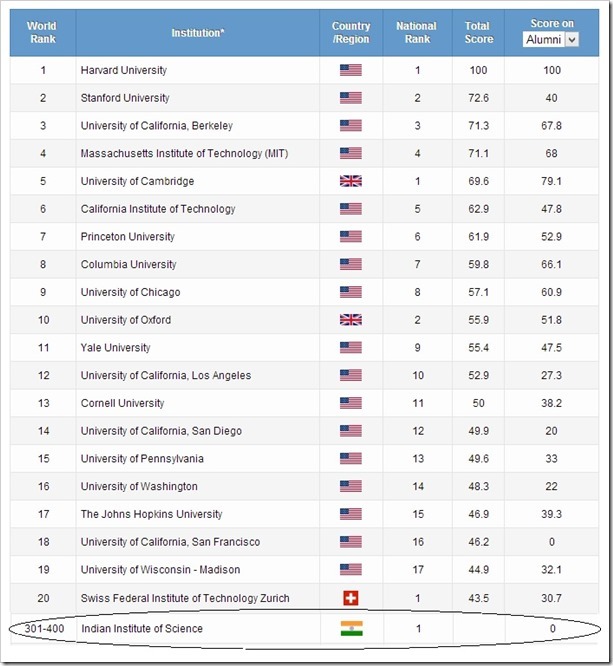 The rankings for India look even more bad, if you compare our neighbors China – The latter has 42 universities in Top 500 compared to India’s sole IISc. Mr. Kapil Sibal – Are you reading this?